Chiang Mai is a town of many markets. As the provincial capital, as well as the largest city in the north, it is the main commercial center of the region. The most interesting markets are the many fresh and food markets. If you head north of Tapae Road along the river, you'll come to the flower market, where you'll find roses, orchids and many other cut flowers on sale. The market is at its most active late at night. Next to the flower market is Wororot Market, one of Chiang Mai's largest markets. This rabbit warren is an easy place to get lost in, but that can be quite pleasurable. 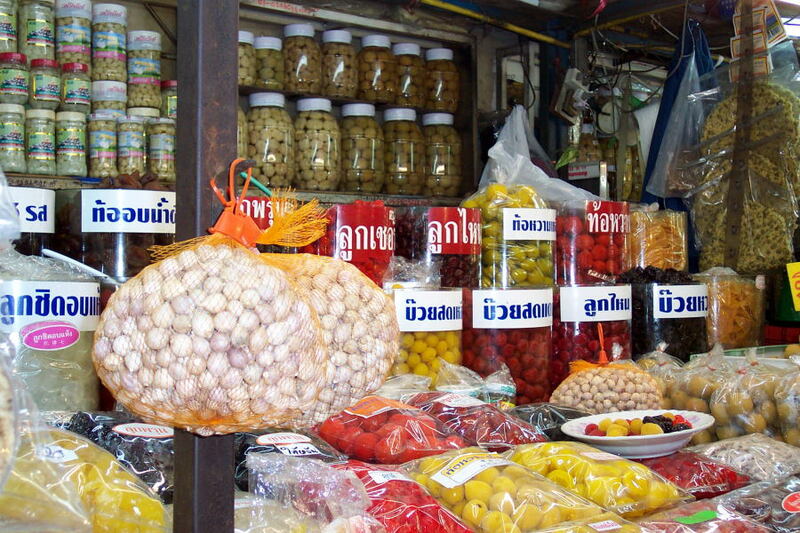 Pickled fruits and spices at the Anusarn Night Market. Not far from the night bazaar along Chang Klan Road is the entrance to the Anusarn Night Market. The market is popular with Thais who flock there to purchase fried pork rinds and the extremely hot green chili dip called nam prik awn. There are lots of giant food stalls as well, making the market a great place to have dinner. 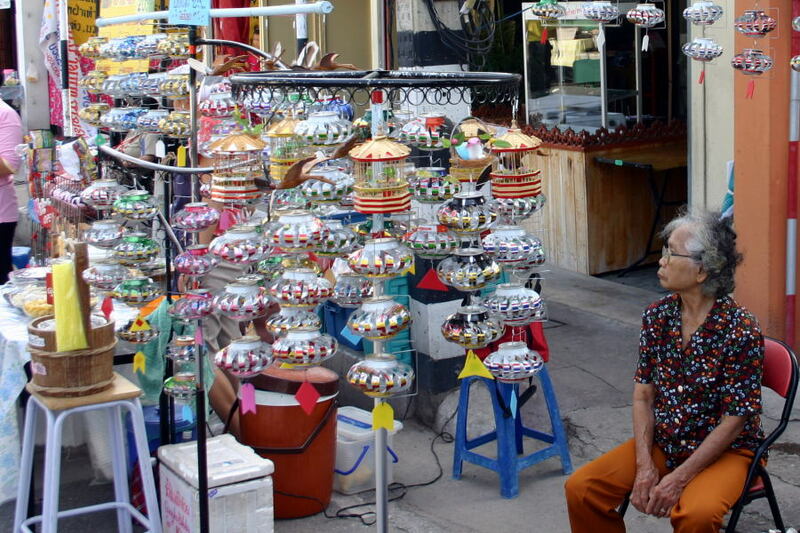 Other notable markets include Sompet Market on Moonmuang Road north of Tapae Gate, a smaller fresh market. There's also a large market on Maneenoparat Road where it meets Chang Puak Road. Strange vegetables at the weekly Hill Tribes market. By far, my favorite fresh market in Chiang Mai is the weekly Hill Tribes market, held every Friday morning in a small lot near the Mosque on Chang Klan Soi 1, not far from the night bazaar. The humble market is where the ethnic minorities who live around Chiang Mai bring their own distinctive products to market. 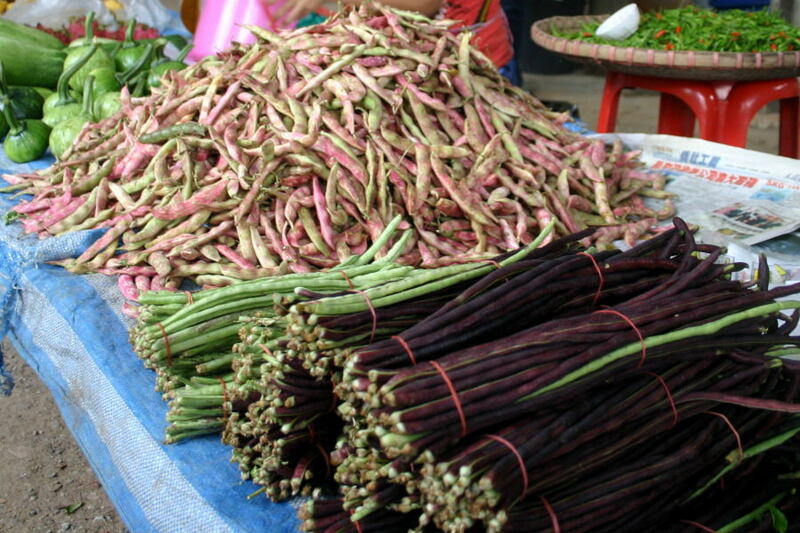 Every time I visit here, I see something new, like the deep purple long beans and pink-speckled pea pods in the photo at left. Some wind-spinners made of recylced cans, on sale at the Saturday Walking Street. In addition to the other markets, and the night bazaar, two other markets have become Chiang Mai 'institutions': The weekend walking streets. Held on Saturday evenings, Wualai Road, the main street of the traditional silver village, is closed from where the road starts just outside Chiang Mai Gate up to Tippanet Road. The market is a lower key affair than the Sunday Walking Street market, although the overall flavor is very much the same. On Sunday evenings, the street running from just inside the Tapae Gate up to the center of the old city, along with some side streets, is closed to traffic. The streets are filled with stalls selling local handicrafts as well as foods of every kind. This market has become something of an institution, although many foreign visitors don't ever know it exists.